Today, the ban on single-use plastic bags went into effect for the City of Hoboken. All retail and food establishments are now prohibited from providing plastic carry-out bags to customers. Hoboken is the largest municipality in the State of New Jersey to enact the bag ban, and the first in Hudson County. To help raise awareness of the new regulations, Mayor Ravi S. Bhalla visited various local businesses, including Little City Books, Sobsey’s, Tunes, Organic Basic Foods, and ShopRite to thank them for enthusiastically complying with the ban. “Improving our local environment starts with a partnership with our business community,” said Mayor Bhalla. “I thank each and every Hoboken establishment, both big and small, for adopting our new regulations to eliminate our reliance on harmful plastic bags. 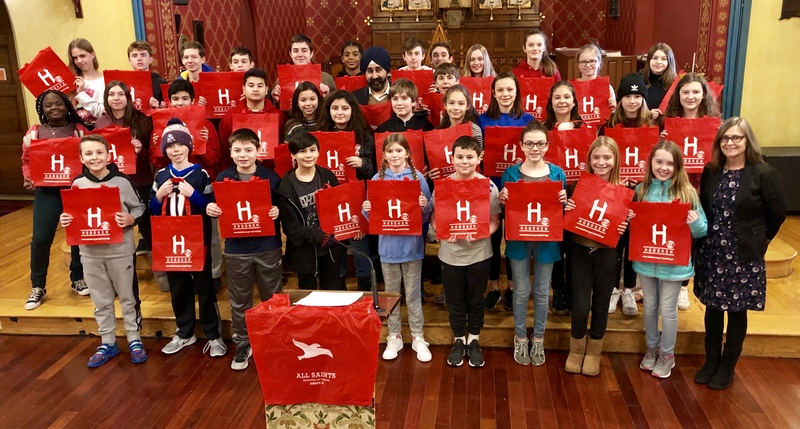 Mayor Bhalla also visited All Saints Episcopal Day School in Hoboken to meet with students in Grades 3-8, thanking them for their long-standing environmental efforts in urging a ban on plastic bags in the city. All Saints students began researching the impact of plastic bags on the environment in 2014, and multiple grades in recent years presented proposals to the City Council to ban plastic bags. The ban was originally drafted by Councilman Jim Doyle and the Hoboken Green Team, and was passed by the Hoboken City Council and signed into law by Mayor Bhalla on June 22, 2018.